A recent news item has reported that the parliamentary watchdog, the Committee on Public Enterprises or COPE had summoned the Central Bank Governor and his deputies on a complaint made by the Auditor General (available at: https://www.colombotelegraph.com/index.php/bond-scam-cope-summons-arjuna-mahendran-issues-2-week-ultimatum/). The complaint has been that the Central Bank, the operational arm of the Monetary Board which owns the Bank legally, had refused to provide the information which the Auditor General had sought for in connection with Treasury bond transactions despite repeated reminders. The news report says that COPE members had grilled the Deputy Governor as to why the information sought by the Auditor General had not been submitted. The answer had been that the data requested had been market-sensitive and their release would have threatened the smooth functioning of financial markets. However, COPE had not been convinced of that argument and it is reported that the Central Bank management had been given an ultimatum to comply with the request. There is no way to verify this news item independently since the COPE proceedings, unlike the US Congressional hearings, have not been open to the media. As such, what has been reported in the media could be hearsay. Yet, neither COPE nor the Central Bank’s Monetary Board has disputed the news item so far. Hence, citizens are to believe that the news item has correctly reported the transaction that had transpired between COPE and the Central Bank’s senior management at the meeting under reference. If this report is correct, this is another severe dent on the reputation of the Monetary Board which has lost it in large measure due to its intransigent action or negligence in the recent past. This writer drew the attention of the Monetary Board to the eroding reputation of the Board in a number of articles in this series in the recent past to no avail. When the first bond scam hit the market in February 2015, this writer warned the Board that its handling of the case was unprofessional and therefore it led to an erosion of its reputation (available at: http://www.ft.lk/article/398709/From-bomb-disaster-to-bond-disaster--How-to-restore-the-lost-reputation-of-the-Central-Bank ). When the Governor and the Board started to act as the owners of the Bank and not as its trustees, another article in the series reminded them of their trusteeship obligations (available at: http://www.ft.lk/article/400701/Central-banking-18--Governor-and-board-members-are-trustees-and-not-owners-of-the-central-bank). When the Central Bank made a colossal loss in 2013 and despite the losses, the Monetary Board made another colossal profit transfer to the Government, this writer warned that it gave rise to questionable governance and reputation risk in another article (available at: http://www.ft.lk/article/393446/Questionable-governance-when-loss-incurred-CB-has-made-a-profit-transfer-to-Government). The Monetary Board maintained complete silence over this issue and acted as if it had not made any loss in its operations. However, when 2014 was also marked by losses, and the Board had continued to make profit transfers to the government causing a sharp decline in its capital funds, the attention of the Board was drawn to the imminent threat to its solvency (available at: http://www.ft.lk/article/417877/The-continually-loss-making-Central-Bank-puts-nation-on-red-alert). The Board sprang into a defensive mode at first and to an offensive mode later by disputing this writer in a series of exchanges. The Board first justified loss making by claiming that the central banks were not supposed to make profits since they had to conduct monetary policy at a cost to the nation. When this writer pointed out that the issue was not about ‘not-making profits’ but about ‘making continuous losses’ (available at: http://www.ft.lk/article/421599/A-Central-Bank-missing-the-main-point-puts-the-nation-on--extra--red-alert), the Board took the position that even loss-making was not a problem since the government, as the owner of the central bank, could provide funds at any time to recapitalise a bankrupt central bank. The futility of this argument was presented by this writer in a further article (available at: http://www.ft.lk/article/424477/The-issue-of-continual-losses-and-depleted-capital--Central-Bank-still-misses-the-main-point ) since the Sri Lanka Government did not have such free money to be wasted on a bankrupt central bank. This writer advised that the Monetary Board should go for a restructuring plan immediately to reverse the ominous trend. However, 2015 was also marked by a similar loss that had eroded the Bank’s capital funds to a critically low level. Since the Board was taking losses lightly, this writer argued that it was no better than the bankrupt SriLankan Airlines which also held such a callous attitude over its losses (available at: http://www.ft.lk/article/539287/Continuously-loss-making-Central-Bank-is-no-better-than-SriLankan-Airlines). The Board immediately jumped into action by issuing a statement based on its previous line of argument and going to the extent of discrediting the opinion of this writer as one coming from a ‘retired employee of the central bank’ and not from someone who had held senior positions of the Bank for more than two decades. Then it was pointed out by this writer that the way the Board had calculated profits of the Bank was erroneous and it should not watch impassively the fast depletion of the capital base of the Bank (available at: http://www.ft.lk/article/542140/Wisdom-of-a-Monetary-Board-impassively-watching-over-a-fast-declining-capital-base). There was no further response from the Board but it did not mean that it would have taken the message seriously. When the second bond scam hit the market in March 2016, the Board did not take any action to correct it. This was pointed out by this writer in two articles in this series. In the first article (available at: http://www.ft.lk/article/537863/A-cherry-picking-Monetary-Board-when-another-major--bond-scandal--is-rubbing-on-its-nose), it was pointed out that the Board had to act very fast in order to keep its reputation intact. When the pressure was mounting, the Board took a step backward and issued a very brief statement implicitly admitting that the systems in place in the Central Bank were not ideal and needed improvement. This was a too late and too short course of action by the Board. This writer in a further article reminded the Board that it had lost a valuable opportunity by its non-action when the irregularities in the bond market were brought to its notice in the past (available at: http://www.ft.lk/article/546108/Monetary-Board-s-latest-statement-on--bond-fiascos---A-step-backward-and-waking-up-from-a-demonic-dream). 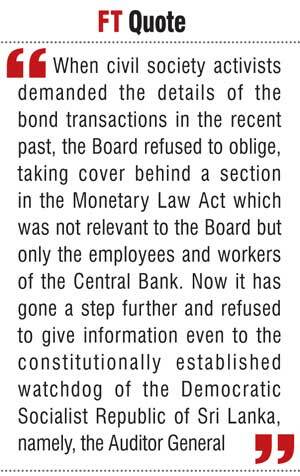 When civil society activists demanded the details of the bond transactions in the recent past, the Board refused to oblige, taking cover behind a section in the Monetary Law Act which was not relevant to the Board but only the employees and workers of the Central Bank. Now it has gone a step further and refused to give information even to the constitutionally established watchdog of the Democratic Socialist Republic of Sri Lanka, namely, the Auditor General. In terms of section 42(1) of the Monetary Law Act or MLA under which the Monetary Board gets its powers, it is the Auditor General who should audit the accounts of the Central Bank. This provision has been further strengthened and codified by section 154(5)(a) of the Constitution. This section further empowers the Auditor General to call for information and explanations from entities that are being audited by him for performing his duties as the auditor. The Monetary Board should consider the Auditor General as its ‘third eye’ watching over the matters that are not visible to it and not as an enemy. Hence, it does a disservice to it by refusing to release information called for by the Auditor General. In other words, it is effectively blinding its third eye so that it cannot see what is happening in the Bank under its own nose. But this was not the first time the Central Bank’s Monetary Board had been confrontational with the Auditor General. During 1989-92 when Dr H.N.S. Karunatilake was the Governor and Chairman of the Monetary Board, there was such a confrontation with the Auditor General that it finally went up to the level of COPE. The Board continued to deny the information sought by the Auditor General on the same grounds as it does today. That is, by maintaining that releasing sensitive information to the Auditor General would lead to financial sector instability. However, the Board’s continued intransigence was an embarrassment to the Government which had been seeking foreign investments into the country in large volumes to rebuild the economy which had fallen to a slow growth mode following the insurgency during 1988-89. When it became clear that peace could not be made between the two confronting parties, the government decided not to reappoint Governor Karunatilake in 1992 on expiry of his existing term. Then, it was left to the new Governor, Mr. H.B. Disanayaka, to initiate action on behalf of the Monetary Board to make peace with the Auditor General, reaffirm the Board’s commitment to cooperate with COPE and reformulate the Bank’s accounting system in terms of the global best practices. This writer, who was a member of the Central Bank team that appeared before COPE, still recalls the tense situation that prevailed at the COPE meeting. There were hostile brickbats thrown at first, but when Governor Disanayaka made his solemn promise, the tense atmosphere began to cool off paving way for an amicable settlement. The Bank agreed to release the data and information to the Auditor General promptly so that the latter could report back to COPE on matters pertaining to the operations of the Central Bank. By acting in that wise manner, the Board saved the government of possible embarrassment. A similar dispute arose between the Monetary Board and the Auditor General during the latter part of the second term of the Governor A.S. Jayawardena and the early part of the term of the Governor Sunil Mendis. The dispute arose with respect to the issue of converting the Central Bank’s accounting system to International Accounting Standards and audit system to International Auditing Standards. The Board had earlier decided under the modernisation program it had introduced to the Bank that its accounting and auditing templates should be based on international standards. Hence, it was necessary to engage the services of international auditors to conduct the new audit of the Bank. But under MLA, it was the Auditor General who had to audit the accounts of the Bank and report to Parliament through the Minister of Finance. But the Auditor General did his audits in terms of Sri Lanka Accounting Standards and, for that purpose, accounts had to be prepared in terms of those standards. Thus, it was a dispute which had to be sorted out early. On instructions from Governor A.S. Jayawardena, a Central Bank team was led by this writer to make representations to the Auditor General Sarath Mayadunne. Though the discussion was cordial, there was no way for the two parties to reach a compromising middle ground without respecting each other’s positions. Mayadunne held that he had a right to audit the accounts of the Bank in terms of Sri Lanka Accounting Standards, the decision to engage international auditors was a matter for him, his interest to audit the accounts of the Bank was in terms of the audit principle enshrined by ‘value for money’ and if his capacity was limited in that respect, he could hire experts to help him. The view expressed by the Central Bank team was that the Bank needed to modernise itself, and modernisation demanded it to adopt global best practices which should be acceptable to the global investor community as well. Hence, it was pointed out that Auditor General’s standing in the way of the Bank’s modernisation was detrimental to its future operations. The two parties had to recognise the interests of each other in order to reach a workable solution. This was exactly what the Central Bank team and the Auditor General did at that time. What was necessary was to recognise the mutual interests of each other. Monetary Board recognised the professional interests as well as the constitutional obligations of the Auditor General. The latter recognised the need for modernising the Central Bank. In that way, a compromising middle ground was reached and that arrangement is still in operation. The Monetary Board should be mindful of the global developments of good governance in which all public authorities are subject to public review today in order to prevent them from being captured by interested parties. This menace known as ‘regulatory capture’ is the worst public enemy possible. The Indian Supreme Court in a recent public interest litigation directed the Reserve Bank of India to disclose the large loan defaulters of banks when RBI took the position that it was sensitive information (available at: http://www.india.com/news/india/supreme-court-admonishes-reserve-bank-of-india-1101915/). Later, RBI is reported to have submitted the required information to the Supreme Court in a sealed envelope with a request to keep such information confidential (available at: http://indianexpress.com/article/india/india-news-india/bank-defaulter-bad-debts-rbi-gives-supreme-court-defaulter-list-with-confidentiality-rider/). This is an eye-opener for Sri Lanka’s Monetary Board which continues to deny providing the information sought by Auditor General embarrassing itself as well as the government. Hence, by refusing to release information relating to bond transactions to Auditor General, the Monetary Board is embarrassing not only itself but also the Minister of Finance, the Prime Minister and the President who are committed to establishing a good governance society that guarantees the freedom of citizens to have access to information. It should not try to dent its reputation by being intransigent and adamant. Civil society is watching the behaviour of the Board and that society is most powerful today. Hence, the Board should have been more mindful when it chose a confrontational course with the Auditor General in the first instance.